The rectus sheath consists of two lamina, the anterior sheath and the posterior sheath. The sheath is made up of the aponeuroses of the three anterolateral abdominal muscles (external abdominal oblique, internal abdominal oblique and the transversus abdominis) as they converge at the linea alba. The makeup of the anterior and posterior sheaths vary depending on the level of the abdominal wall you examine. anterior sheath is made up of a combination of the aponeurosis of the external abdominal oblique EAO and the internal abdominal oblique IAO. posterior sheath is made up of a combination of the aponeuroses of the internal abdominal oblique IAO and the transversus abdominis muscles TA. Notice that the aponeurosis of the internal abdominal oblique splits around the two sides of the rectus abdominis muscle. the anterior sheath is made up of the aponeuroses of all three abdominal muscles EAO, IAO, and TA. 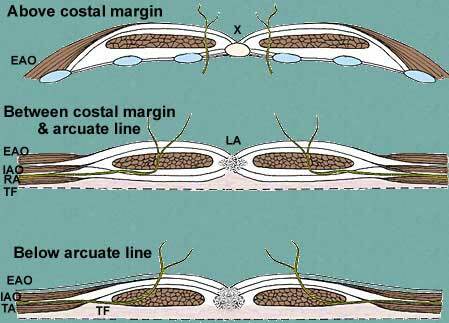 there is no posterior sheath below the arcuate line. The transversalis fascia makes up the posterior aspect of the rectus abdominis muscle.